Many seniors, particularly those who are confused, find large, resort style facilities confusing and intimidating. Our size provides a manageable setting, one in which residents can easily become familiar with their surroundings. For residents who have difficulty walking, the short distances between apartments and common areas at the Grace Morgan House, versus the long corridors of corporate facilities, are a godsend. Our smaller size increases opportunities for socialization and makes it easier and more likely that a resident will participate in activities and conversation in our common areas. Most importantly, our size allows us to develop highly personal and individualized relationships with our families. This helps to insure that communication is at a high level and allows us to work closely with our families as their loved one’s needs change. “While our investigation suggests that you or a family member might receive better care at a not-for-profit or independently owned facility, they make up a small portion of the industry. Since the establishment of Medicaid, the state and federal program for the poor and the elderly, in the 1960s, for-profit homes have come to dominate the field." Meal times are one of the most important times of the day for seniors. We place a high importance on food and the socialization around meal time. Almost all of our meals are made from scratch, and feature a wide variety of “comfort” foods. We only use fresh fruit and vegetables. Our cook comes from a restaurant background rather than an institutional food services background. When considering an assisted living residence, the key question should always be about the staff. We are especially proud of ours; not only our certified nursing assistants (CNAs), but also our registered nurse, social worker, activities director, cooks and housekeeper. Over time, the Grace Morgan House has been especially rigorous in identifying and hiring the finest staff in the region. Simply delivering care has never been enough. In order for patience, love and kindness to be sincere, they must spring from the CNA naturally. Not all CNAs are naturally patient and kind. Our small size means that the same CNA that helps you with your care, also serves you meals, helps with your meds, and does your laundry. We have a very low CNA staff turnover – this allows our CNAs to develop close relationships and detailed knowledge of each resident’s health and care issues, idiosyncrasies, likes/dislikes and daily routines over an extended period of time. We have the highest CNA to Resident ratio in the Merrimack Valley – during most times of the day and night, we have a 13 to 1 resident to caregiver ratio (versus 25 to 1 in some facilities). 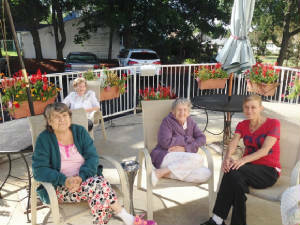 Again, because of our small size, we are able to offer an activities program that has the unique ability to adjust to the very personal needs and interests of our residents. Rather than have a one large activity for everyone, we are able to create activities for small groups or individuals with a particular interest. Thank you for considering Grace Morgan House. We invite you to come by for a visit. A phone call to arrange a time and day is appreciated, but drop in visits are usually not a problem. Suzanne and I are almost always here.